Each periods payroll must be processed, this guide will go through the process that your payroll officer will perform. Once all timesheet data has been checked or approved, you can start your payrun. Most of the values to start a payrun should be correct. You just need to fill the payment date. Mouseover the info dots to learn more about each field. If it's your first run in Microkeeper, you will need to select the week you want to process for. If it's your first payrun for the financial year, double check the number of runs that are expected for the year is correct. Microkeeper will predict how many runs are likely based on your payment date in arrears value. When you begin your Payrun, the timesheet data is converted into payroll data. All the rules you have created are applied in relation to the timesheet data including overtime penalties, unpaid breaks etc. Employee entitlements which include personal leave, annual leave, long service leave and/or rostered days off are calculated and accrued. After the calculations are complete, a line will be added to the payrun feed. 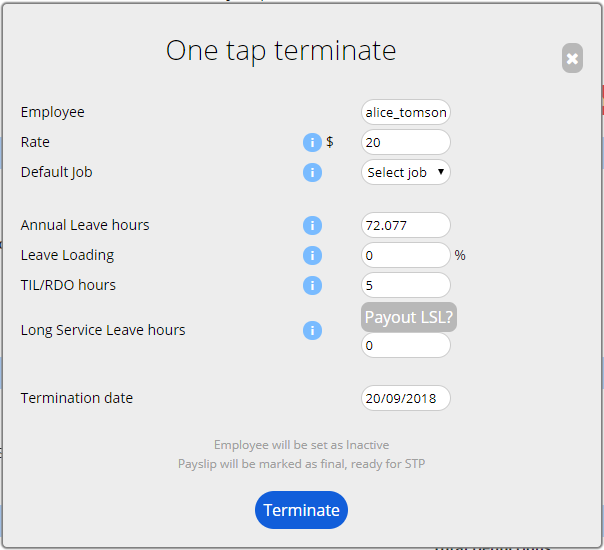 If you need to run the payrun again for all staff you can click the grey payrun button. If you need to run the payrun again for an individual, which is usually recommended, there is a payrun button on the individual's payslip. To view the payslips for that run, click the grey payslip button. From the payslip page, you can view each individual payslip. You are able to add leave requests to the payrun, add a public holiday payment and any extras or deductions that apply to the week. You should only need to add extras or deductions if there are no rules in place for the payment. If you find you are adding the same extras or deductions every payrun, you may need to review your payroll rules. To bulk add a payment such as an Incentive or Bonus click the Other Payment Button. Import a CSV of Payments to be uploaded, the format of which matches column order in the above screenshot. The details entered here will be automatically applied to the individual payslips. To add payments from a file, for example, Salary Packaging. Start by clicking the Add Payment button on the Payslip, then click Upload CSV File. Select a CSV File in the below column format and once uploaded it will fill the below fields with the details of the file. All the approved and pending leave requests for the given run will be displayed. Once you have verified all the leave requests for this payrun, you can submit the leave. This will automatically apply the selected requests to each individual's payslip. You can check and add on any entitlements or make changes to any of the calculated data on the Payslip. Below is an example of a Payslip, on the right you can add, edit or delete any of the lines. You may, on an occasion such as termination, be required to pay out any outstanding leave balances. To do this, you need to select Final located at the top of the payslip. A screen will pop up auto-populated of data for the employee. You have the option to payout Long Service Leave. Click terminate to calculate their final payout. Check to ensure the payslip is correct and the Annual Leave balance is now zero. A Seperation Certificate may be required for terminated employee's receiving Centrelink Benefits. Once the payroll data is accurate, and the payment date is correct, an .ABA file can be generated. You can then save the payslips to a PDF back up, print payslips and Lock the Week, making payslips available to your employees online. After locking the week you will be able to lodge the Single Touch Payroll Form. STP Lodging will be available from 1st of July 2018. For more information about Single Touch Payroll.